held throughout the week and popular classes offered during evenings and weekends. A complete list of classes can be found on the Lethbridge First Aid website. Lethbridge First Aid offers the cheapest rates. Rates are paid in full during enrolment so trainees don’t have to worry about payment during the training period. Rates include taxes, certificates, and St Mark James training manuals. If a trainees drop out, he or she is entitled to a full refund, provided a 72-hour notice is given beforehand. Enrolment is quick and easy. Prospective students can enrol on the Lethbridge First Aid website, using the on-line registration form. Other ways to enrol include e-mails, telephone calls, and in person at any of the facilities in Alberta. First aid programs are taught by St Mark James certified instructors. First aid classes at Lethbridge First Aid cover a comprehensive list of topics include emergency medical services (EMS), cardiopulmonary resuscitation (CPR) and automated external defibrillation (AED), wound care, and injuries that affect circulation and breathing. 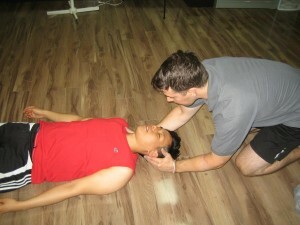 First aid programs last 14-16 hours in total. CPR/AED only classes are also available in three levels: A, C, and HCP. These programs last 4, 5, and 6 hours respectively. AEDs are machines that are attached to the chest and apply needed shock to the heart. Certificate cards are awarded to students once they pass the class. To pass a class at Lethbridge First Aid, students are required to have complete attendance, at least 75 percent on the written exam, and good skill demonstration. Wall-mount certificates are also available upon request. Certificates are only valid for three years and can be renewed, if current, through recertification programs. First aid recertification lasts 8 hours, and includes CPR level C recertification. Private training is also offered at Lethbridge First Aid. Private instructors are trained by St Mark James as well. They have different hourly rates but you can send an e-mail or give a call to inquire about them. You can book them for training at home or special events like company outings and conferences. While most cuts and scrapes heal on their own without complications, deep wounds known as lacerations require medical assistance have to be brought to the emergency room. Deep wounds often need stitches or butterfly tape for shallower wound. Here are some first aid tips in handling a deep wound. Control the bleeding with light pressure and piece of gauze or cloth. Use clean water or sterile saline over the wound to clean it and remove any visible particles. Temporarily cover the wound lightly with some gauze and a bandage. Visit the emergency room and get stitches. Change the dressing everyday or when it gets dirty. Watch out for any signs of infection such as abnormal redness, increasing pain, foul odor, and yellow drainage.